Wahoo! do we have fun planned for you! Check out all the Fall Frolic Info below. This program includes Friday and Saturday night occupancy for 2 persons in your immediate family and one car. Labor Day & Columbus Day Weekend includes Friday, Saturday and Sunday nights. See below for 2019’s rate schedule, depending upon the type of hookups you reserve. The additional costs for your children are included in the rates listed below as well. An additional car will be charged the normal rate (refer to site rates and info page) while it is in the park. Your RV remains on your assigned site during the week until final check-out date by 12noon. Check-in time for occupancy is 2pm-9pm on Aug 23rd and 9am - 9pm each Friday thereafter. Check-out time is by 8pm each Sunday, except for final check-out of 12noon. 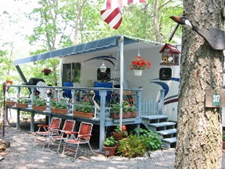 You may occupy your RV other than Friday-Sunday with pre-paid registration at the current nightly rate (2 persons). The “Fall Frolic” program price is for two persons in your family. Your unmarried children (under 18 years) are charged a base fee for the program. If you do not choose to pay the child(ren) base program fee, then each of your children (under 18 years) upon arrival will be charged the published Visitor Admission Fee, depending upon their dates of occupancy. For additional cars and equipment, refer to the rate list in our brochure or on our website. Friday and Saturday occupancy cannot be switched for other nights during the week. Unused Friday and/or Saturday nights cannot be accumulated for occupancy at another time or used by another party in your absence. A non-refundable deposit of $200.00 is required to confirm your reservation. MasterCard, Visa, Discover or cash is accepted. Interested in Seasonal camping? Please inquire as to available sites!